Ok I am finally back! Apologies for the absence but this last week has been such a whirlwind, I just couldn’t keep up! I am working on a huge project for you all that I promise to share very soon. So while I make you wait in anticipation (it’s killing you, isn’t it? ), I promise to reward your patience with some amazing summer-y food! 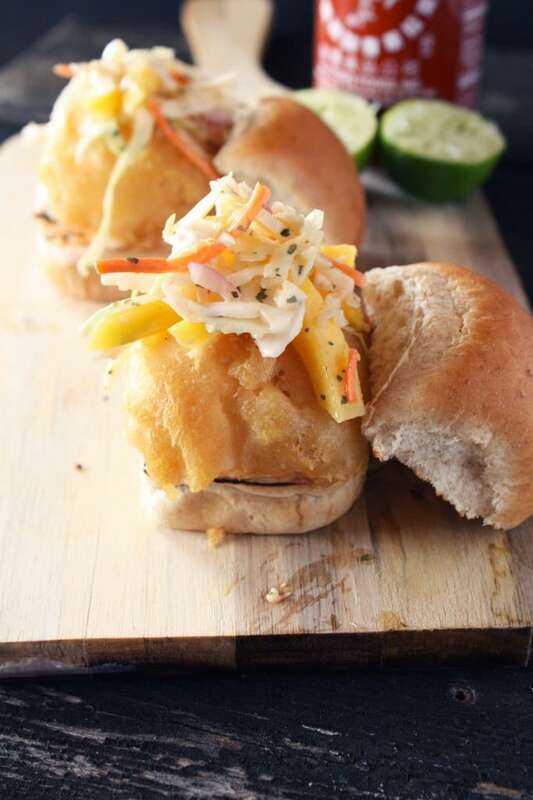 If you haven’t noticed, sliders are quickly becoming my favorite appetizer this summer. It falls under the “these are miniature and therefore I can eat more of them” category. To be honest, I had never really tried my hand at frying fish before. After hit or miss fish and chips orders at restaurants across country, I can appreciate just how hard it is to get a perfectly golden brown, crispy, and non-oily piece of fried fish. I just happened to stumble upon this perfect fried fish recipe one day. Little did I know I would end up with gorgeous little fried pieces of fish, just screaming to be topped with a spicy mango slaw and Sriracha mayonnaise. 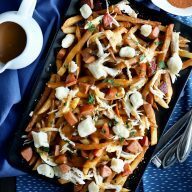 This is the perfect summer appetizer, especially for those hot afternoon BBQs when your grill is packed with hamburgers, hot dogs, and brats. Just fry them up and smash them in your face! Delish…. 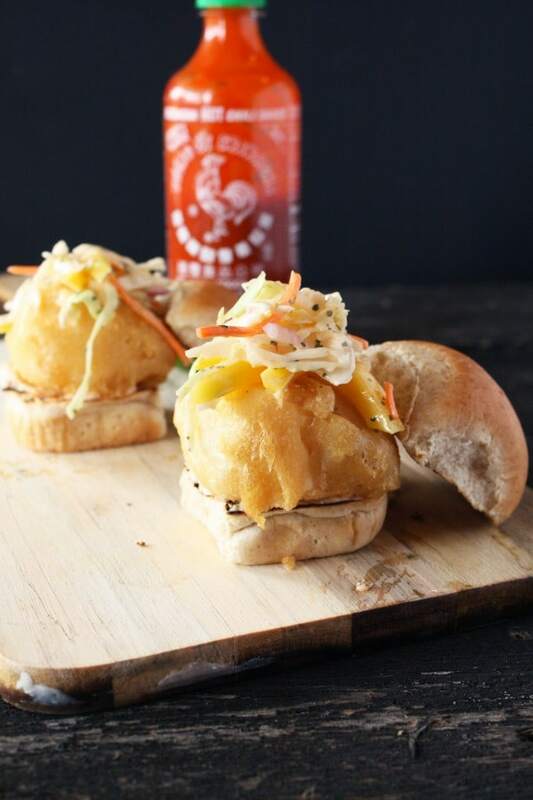 Perfectly fried fish on a grilled bun with a spicy mango coleslaw and Sriracha mayonnaise. 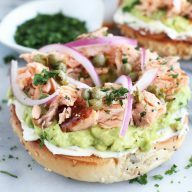 Mix the mayonnaise, Sriracha, lime juice, sugar, 1/4 cup cilantro and 1 tablespoon water in a large bowl. 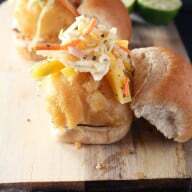 Toss with the coleslaw mix, mango, and red onion. Season with salt and pepper and set in the refrigerator until ready to serve. In a bowl whisk together the flour and baking powder. Whisk in 1 cup seltzer until smooth and let batter stand for 10 minutes. Heat oil in a heavy-bottomed pan over medium-high heat until it reaches 350 degrees. Season fish with salt and pepper. Working in batches, dip each fish piece in the batter, transfer quickly to the hot oil and cook until golden brown, approximately 2 minutes. Transfer to a paper lined plate to drain before serving. Season again lightly with salt on both sides. 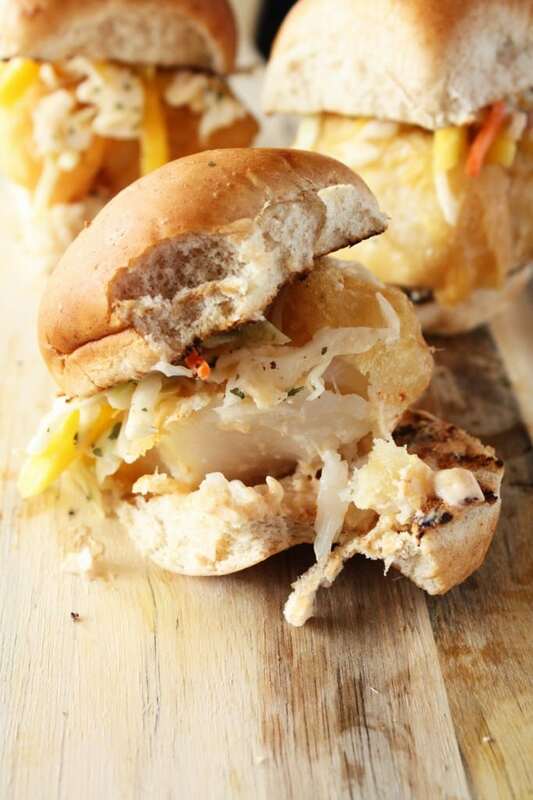 Assemble your sliders with the fried fish pieces and top with coleslaw. If you like extra sauce on your sliders (I always do! 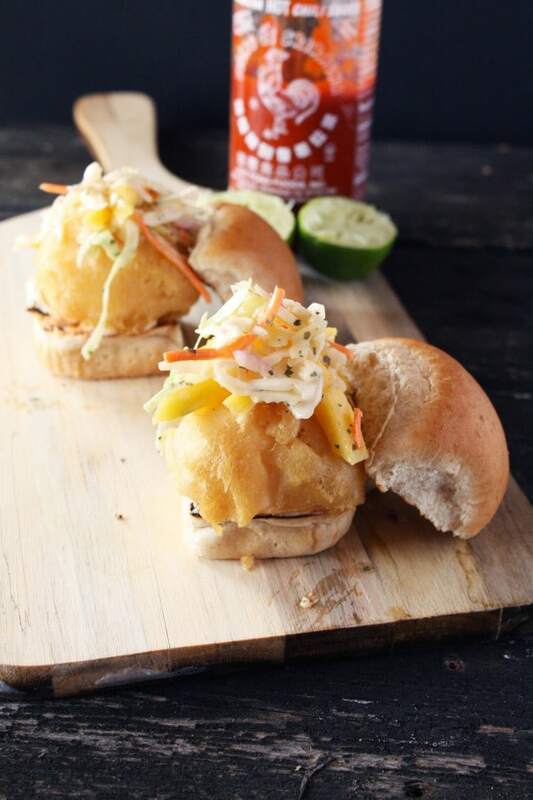 ), add some Sriracha mayonnaise spread on the bottom bun of each slider before topping with the fish and coleslaw. 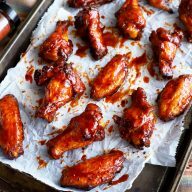 To whip up a quick Sriracha mayonnaise, combine a 1/4 cup mayonnaise with 1 to 2 tsp Sriracha (add more if you want more spice! ).